When the final report was printed, I found that I appeared in one of the photos taken by the official NASA photographers. In the photo on the right, I am standing between the white and the black storage cabinets. 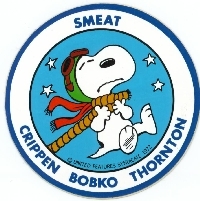 The Snoopy SMEAT test emblem is visible at the upper left of the chamber door. In the photo of the chamber entrance at the far right, I am leaning against the white storage cabinet at the left center of the photo. My clothes appear grey in contrast to the others, who are wearing white shirts and dark pants. 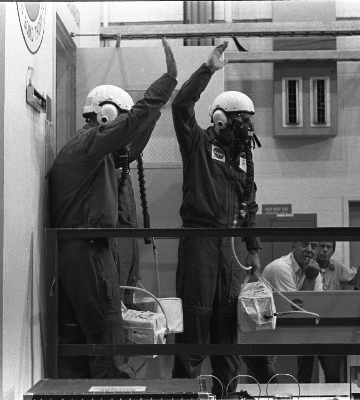 After the crew members entered the chamber, there was some discussion between our managers, the crew and the test team in the control room and the result was that the crew were asked to come back out to the entrance to wave to the press. I was assigned to a later shift so I was able to be there to take these photos on my own time. 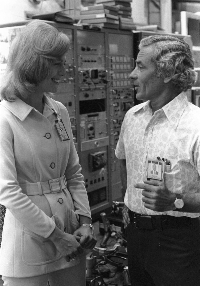 Jessica Savitch was once on TV wearing a white short-shorts suit and white Go-Go boots. She got her start here at one of the Houston stations. She then went on to national network TV. She met an untimely death by drowning in a car accident in 1983 at the age of 35. She was about 25 when these photos were taken The books, ‘Golden Girl’ and ‘Almost Golden,’ tell her life story from two different perspectives. I think she was a little suspicious about having a NASA employee photograph her. 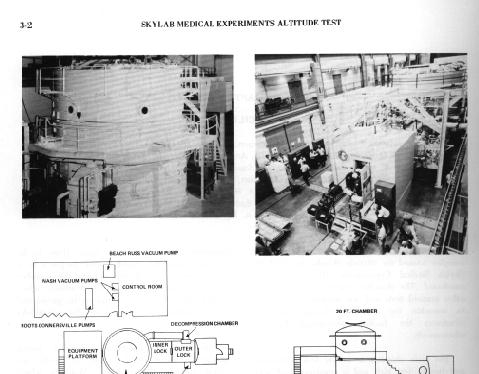 The image at right is a scan of a small part of the negative of the press photo on the first page. It illustrates the fine grain I was achieving with home film processing at the time.. Notice that Jessica is curling up the toes of her right foot and biting her lower lip. She may have wondered why a NASA employee was photographing them. She seemed to have a piercing gaze even through the sunglasses. I was too shy to ask Jessica for a photo, but my friend, Jack Joerns, wasn’t, so I have a nice photo of her and him. (starring Sela Ward), and now a feature film, Up Close and Personal, to be released next month by Touchstone. The new movie, which stars Michelle Pfeiffer and Robert Redford, is based loosely on Savitch's rise from obscure Houston TV reporter to network star. . . In front of a camera, Savitch became a different person. "She came through the glass," says Robert Mulholland, the former president of NBC Television. "When she was on-camera, everyone believed and .. liked her. But no one understood what we had to go through to get her on the air." Her personal life was troubled, to say the least: she had a fourteen-month first marriage, a miscarriage, and a second marriage that ended with her husband's suicide.